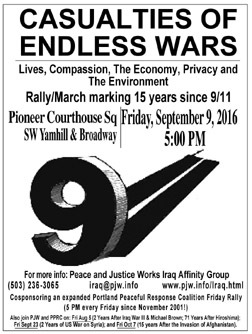 Lives, Compassion, The Economy, Privacy and the Environment"
As the 15th anniversary of 9/11 approaches, the Peace and Justice Works Iraq Affinity Group plans to cosponsor the Friday September 9 Portland Peaceful Response Coalition (PPRC) rally for peace and justice. 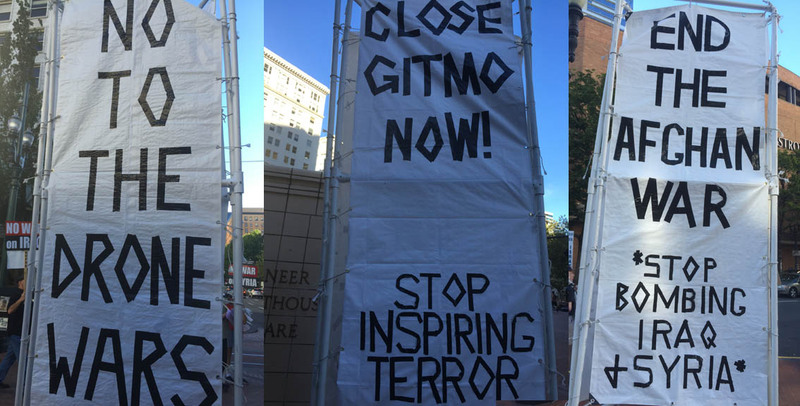 As with every Friday since November 2001, this event will be at 5:00 PM at Pioneer Courthouse Square at SW Yamhill and Broadway. In the decade and a half since September 11, 2001, the US has engaged in military operations in Afghanistan, Iraq, Pakistan, Yemen, Somalia, Libya, Syria and elsewhere. Xenophobia and Islamophobia are on the rise. No money is available for jobs, health care or other human needs while the Pentagon's budget is untouchable. Civil liberties are violated by government spying and unlawful detentions such as in Guantanamo. And the US military continues to be the world's #1 user of fossil fuels, contributing needlessly to climate change. PJW plans to bring its famous 12-foot-tall "Tower of Peace" to the Square in a new, mobile form for this special occasion. On Sept. 9, PJW published a fact sheet explaining the connections among the various casualties of the endless wars. In addition to PJW and PPRC, the following groups have endorsed this event: Recruiter Watch PDX, Little Light of Mine Friends Worship Group, Occupy Portland Elder Caucus, Women's International League for Peace and Freedom-Portland (WILPF), Americans United for Palestinian Human Rights (AUPHR), Jewish Voice for Peace-Portland (JVP-PDX), Occupation-Free Portland (OFP), Portland Central America Solidarity Committee and others. For more information contact Peace and Justice Works at 503-236-3065 or iraq@pjw.info. *Friday, September 23:* "2 Years of US War on Syria"
After the people rose up against a US invasion of Syria in 2013, American warplanes (and drones) began bombing that country to attack members of the Islamic State, with the US and its allies overtly and covertly trying to undermine Syria's existing government. Tensions with Russia over US policy have led to a de facto new Cold War. *Friday, October 7:* "The Afghan Invasion 15 Years Later"
Even though the government of Afghanistan had nothing directly to do with 9/11, the US began bombing the impoverished nation less than a month afterward. The war has never ended, with ongoing US military operations including airstrikes and drone raids, and a promised withdrawal of troops that has been scaled back and cancelled.